For a car hit with ADAS, it’s business in the front, severity in the back. CCC research published in 2018’s “Crash Course” suggested advanced driver assistance systems worked successfully to decrease not only the frequency but also the severity when a vehicle was involved in a front-end collision. 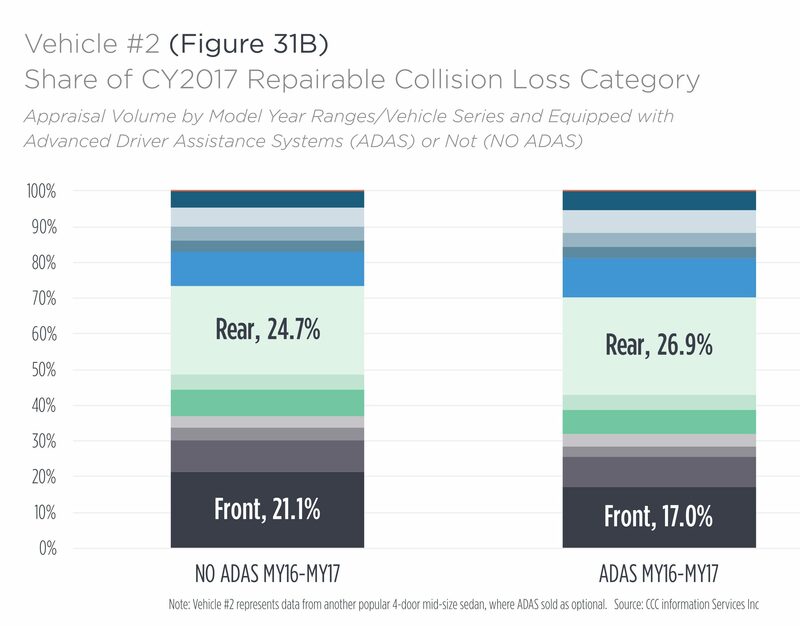 However, the repair bills for ADAS-equipped cars involved in a rear impact — such as getting rear-ended or just backing into something — were higher than their counterparts without ADAS. 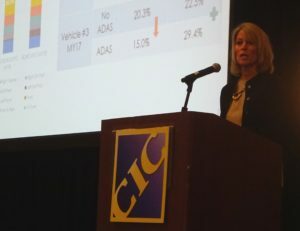 “That was consistent for both vehicles,” CCC director and analyst Susanna Gotsch told the Collision Industry Conference in April. It’s the latest evidence suggesting the hypothesis that ADAS means frequency decreases but severity increases is only half right, or at least is more nuanced than you’d expect. In 2017, Honda reported that a study of Allstate customers found owners of 2016 Honda Civics with the Honda Sensing ADAS suite were in fewer collisions and their crashes cost less to repair than Civics without the technology. CCC looked at a four-door sedan with and without ADAS for two automakers and did the same for a small crossover made by one of the OEMs. It said the frequency of front-end losses fell 3 to 5 percent on the vehicles with ADAS. “Makes sense, right?” she told CIC. In examining the two sedans, CCC found that one ADAS-equipped car’s front-end repairs tended to fall in the lower-dollar range of between $500.01 and $4,000, while the other tended to skew into higher-dollar ranges. Nevertheless, the overall bill came out lower in both cases, $20 less in one instance and $63 less in the other. “(W)hen the accident is not prevented, ADAS systems help slow the vehicle before impact and mitigate the damage and subsequent cost of repair,” CCC wrote. As noted above, the design and capability of the system seemed to affect what was repaired and how often. Gotsch said OEM repair procedures were largely the same and the difference in the cost of replacement parts wasn’t enough to account for the “pretty interesting” difference in distribution. This suggests that the quality of the OEM’s ADAS system is in play, Gotsch said. One of the two OEMs had historically done very well in stopping its vehicles completely to avoid a crash, while the other had done “well” but wasn’t as effective, she said. The configuration of the system might matter; Gotsch mentioned a component mounted in a different location. “That would have something to do with it, for sure,” she said. The sedans also showed different replace and repair rates for various parts involved in such collisions. “The results here too suggest that the two different vehicles analyzed vary from differences in how each automakers’ ADAS technology perform,” CCC wrote. 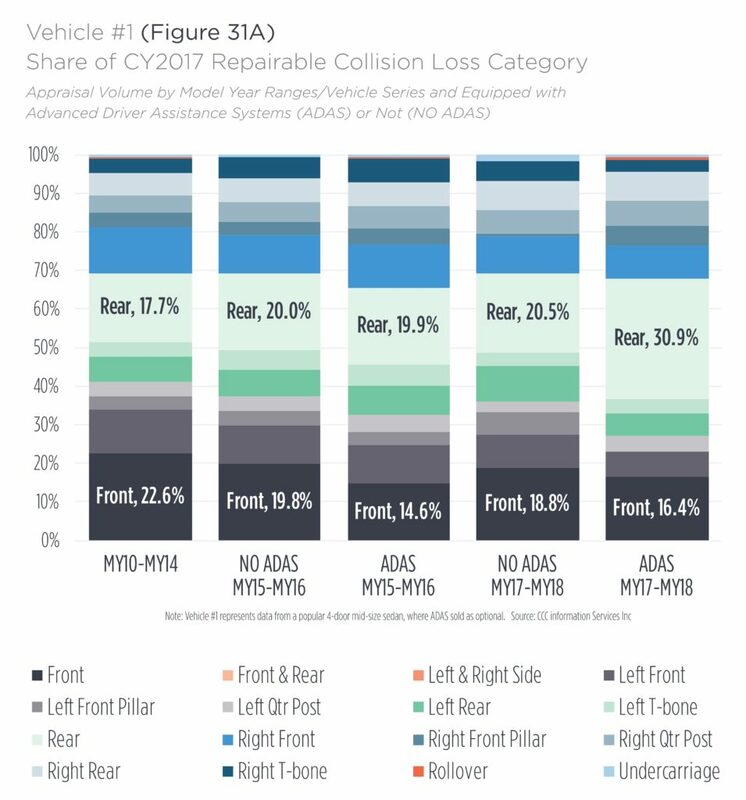 “For example, the ADAS-equipped vehicle appraisals for Vehicle #1 have higher percent of appraisals that include top replacement parts like front bumper cover, headlamp assembly, and fender than vehicles not ADAS-equipped. Rear-end collisions weren’t mitigated by the technology, and both sedans saw higher severity in such claims. Vehicle 1’s average repair bill rose $56 on sedans with ADAS, and Vehicle 2’s cost jumped $67. Gotsch said in an interview CCC didn’t break down whether rear-end impacts were caused by the driver backing into something or getting rear-ended. Technology exists to mitigate the former, but in the case of the latter, ADAS components like backup cameras, parking assist sensors and blind spot monitoring radar are just expensive, useless targets. In both instances, the existence of a collision also might trigger the need to inspect or calibrate sensors on the front of a vehicle, further jacking up the repair cost over an ADAS-less vehicle. “Clearly the technology will change the mix of claims and repairs in the future, but with fewer front end collisions, and accidents overall, auto manufacturers will see a decline in overall part sales,” CCC concluded.